Handipack is a multi-purpose epoxy, supplied only in a small pack. It is designed for quick repair work and small scale construction jobs. The system is extremely reactive with a pot-life of just 8 minutes at 20°C. It is therefore best suited to small tasks, and should not be applied in thicknesses exceeding 3mm. The medium to low viscosity of the material enables it to be used for small laminating tasks, using lightweight glass fabrics, such as those from the SP-High Modulus’s reinforcements range. The system’s good clarity makes it a good sheathing matrix system. Used as a coating, it cures rapidly at ambient temperatures to form a tough, clear film, with good moisture resistance. If the coating is to remain unpainted, the cured material should be over coated with any good two pack polyurethane, since an unprotected epoxy coating will gradually yellow in sunlight. By using the SP range of filler powders, a Handipack resin and hardener mix can be turned into a very effective adhesive or filling compound. 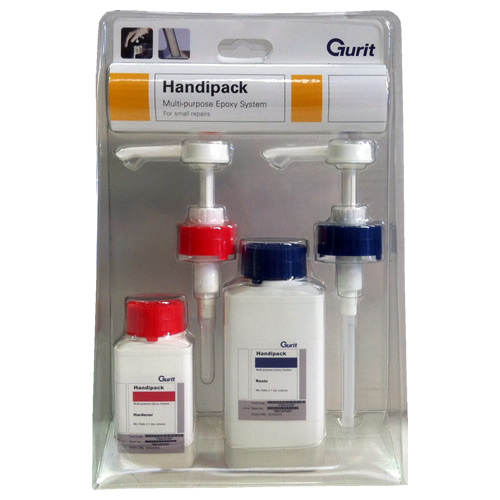 The Handipack is available only in one size (250ml resin and 125ml hardener), with resin and hardener components each supplied with a dedicated dispensing pump that attaches to the container. The resin/hardener/pumps package is contained in a clear blister pack, that can stand on a display shelf or hang from a display rack.